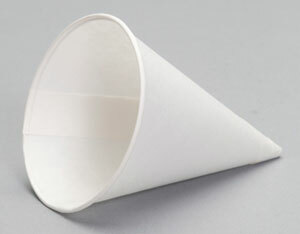 Being compostable is just one of the reasons customers choose our Paper line of cone cups. The variety of sizes (from 4, 4.5 and 5 ounce cups) and styles (rolled rim and straight rimmed) means you have a selection to choose just the perfect cup for your application. Beverages dispensed from water coolers, sports drinks and other larger containers are easy to drink from our paper cone cups. 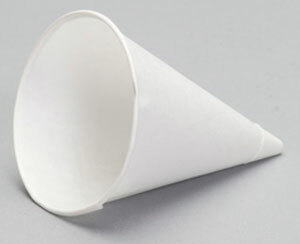 Looking for more than just a plain white cone cup? Ask about our two color printing capabilities to enhance your brand image on our biodegradable cups. In addition, our Caddy Pack options feature corrugated inner sleeves for easy handling. These are just a few more reasons to choose the Harvest Paper line of cups. Be sure to check out our other compostable cups, including our pleated drink cups and portion cups. Please contact us today to learn how to order to ask any questions. Length: 15.380" Width: 13.750" Height: 17.380"
Length: 13.970" Width: 13.970" Height: 17.000"
Length: 15.130" Width: 15.130" Height: 17.250"
Length: 17.130" Width: 15.500" Height: 17.380"
Length: 13.750" Width: 13.750" Height: 15.000"
Descrip: 5 oz. 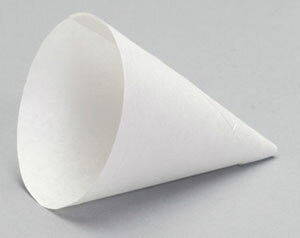 Rolled Rim Paper Cone Cup. Length: 16.000" Width: 16.000" Height: 18.240"